This year saw the best crop of blackberries we’ve seen yet with the largest, juiciest, sweetest blackberries I’ve ever tasted. I think it must somehow be connected with the all-time, record-breaking long, cold, wet Spring we had this year. It was miserable to live in, but it sure did wonders for the blackberries! 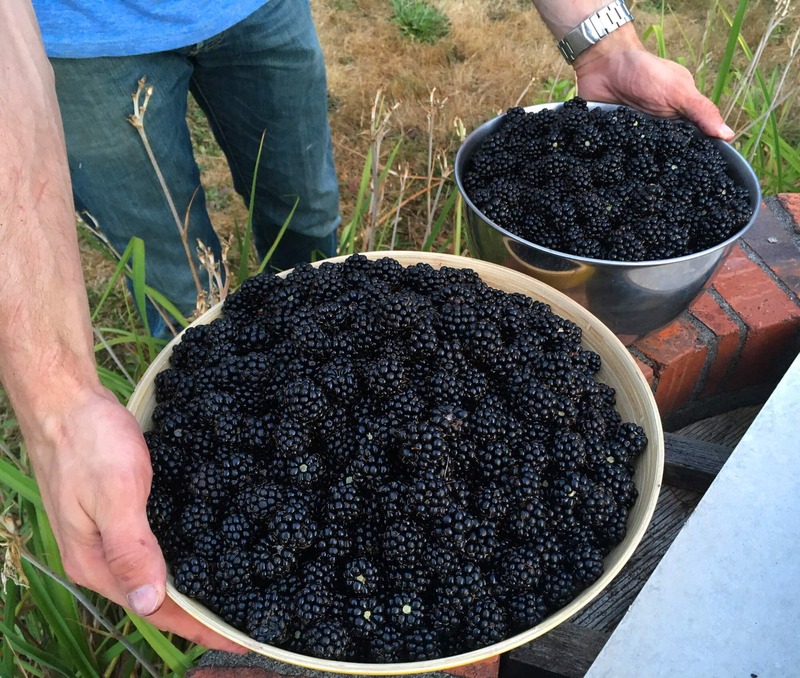 Blackberries are so plentiful here in Washington State, they’re considered an invasive weed. And for the life me, every time we see blackberries for sale in the grocery stores we wonder why on earth anyone would pay for blackberries when they’re so readily available everywhere for free! A tradition Todd and I have kept every year for the past 12 years is picking blackberries together each summer. Up until this summer our record was 19 gallons but this year we’ve got it beat: 22 gallons and still more to come! We usually just freeze them to use in our daily breakfast smoothies throughout the winter but this year I wanted to pick even more so I could have plenty extra for making blackberry syrup. And of course there always has to be some extra for blackberry cobbler and pie! What are some of your favorite ways to use blackberries? 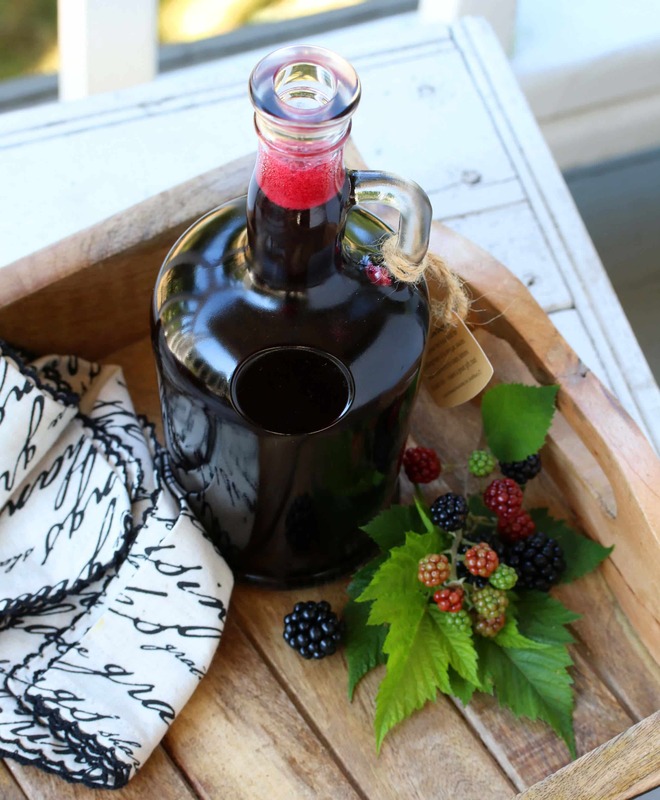 Making your own blackberry syrup is easy to do and the end result is incredibly delicious and bursting with the vibrant flavor of Summer! For anyone interested in canning, I’m also including instructions for canning this syrup for long-term storage so you can enjoy this wonderful syrup all year round. I plan on stocking my pantry with plenty of it before the Summer is through! This syrup can be made with sugar, honey or made sugar-free. 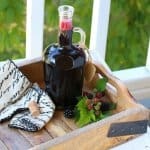 This homemade blackberry syrup is phenomenal on pancakes, waffles, crepes, ice cream, cheesecake and any other way your heart desires! Place blackberries in medium-sized pot with lemon juice and bring to a boil. 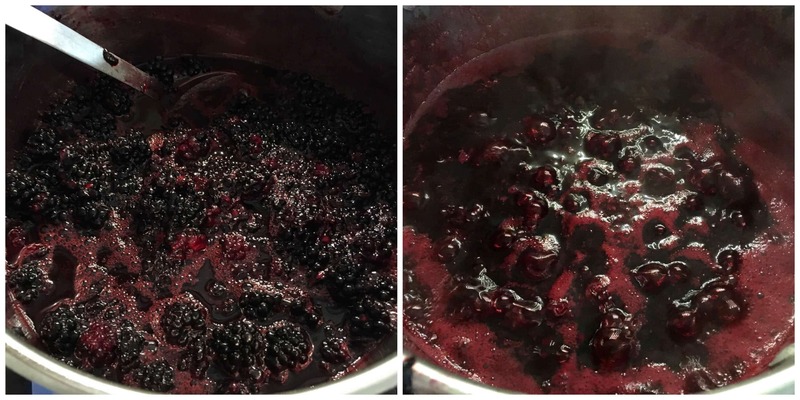 Lower the temperature and simmer for 15-20 minutes until the blackberries. Note: You can stretch this syrup further without diluting the flavor too much by adding 3/4 cup water with the blackberries (then add a little extra sugar/honey/sweetener when you add the strained juice back to the pot. At the end just add an extra teaspoon of pectin at the end (or more if you prefer it thicker). Mash the blackberries with a potato masher just to break them up further. Strain the blackberries in fine mesh sieve or colander, collecting the juice in a large bowl. A cool gadget I ordered on Amazon a while ago is this jam strainer. It’s nice because you can suspend the fruit from above and let it drain by itself down into the bowl below. You can find it here on Amazon. You should have about 3 full cups of pure blackberry juice. If it yields a little less or a little more, that’s fine. 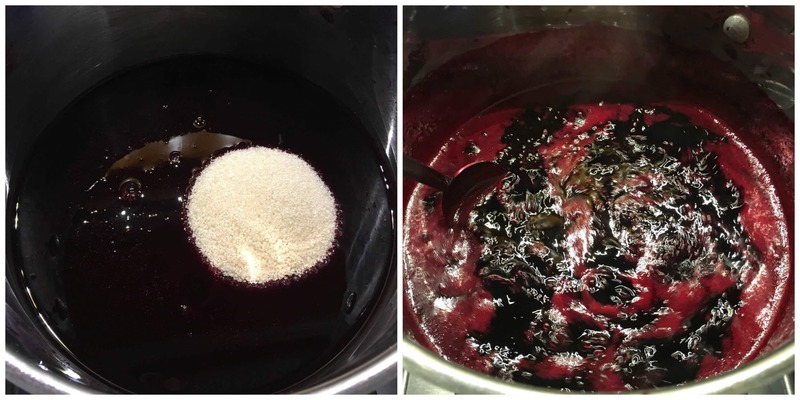 Place the blackberry juice back in the pot along with the sugar (or honey or alternative sweetener). Bring to a boil and boil for 3 minutes. Stir int the pectin and boil for another minute. Remove from heat. At this point you can either use the syrup immediately or let it cool and store it in the fridge for up to two weeks. OR you can extend its shelf life by canning it. 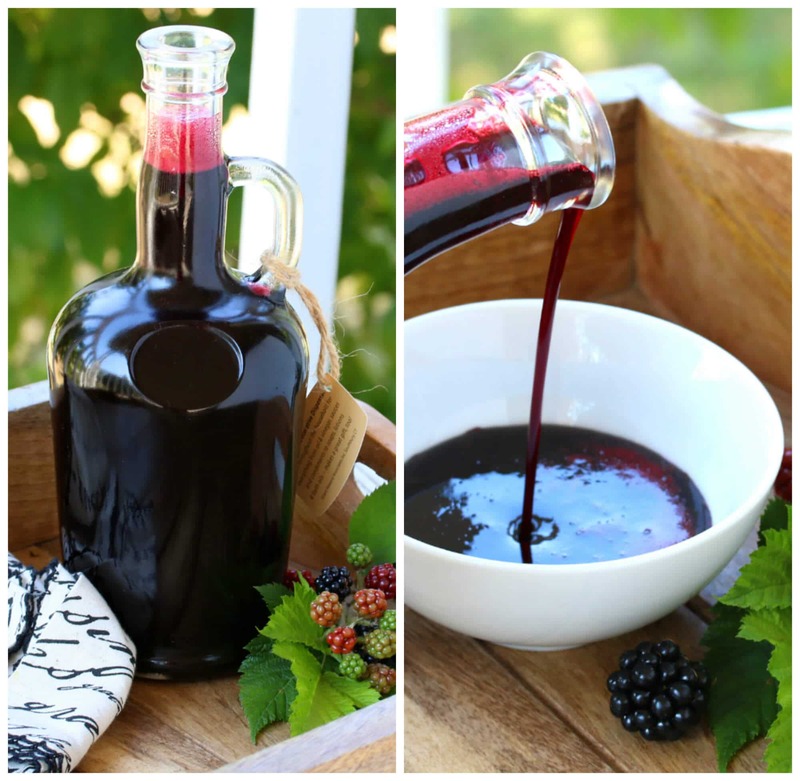 It’s super simple to do and will allow you to enjoy this delicious blackberry syrup all year long. Simply pour the hot syrup into sterilized canning jars, leaving 1/4 inch headspace from the top, wipe the tops of the jars with a damp cloth, and screw on the lids. Place the jars in a boiling water bath and process pint jars for 10 minutes and quart jars for 15 minutes. Carefully remove the jars and let them sit undisturbed for 24 hours. Store them in a dark, cool place and they’ll keep for at least a year. If you don’t already have a canner here’s a complete set of everything you’ll need. 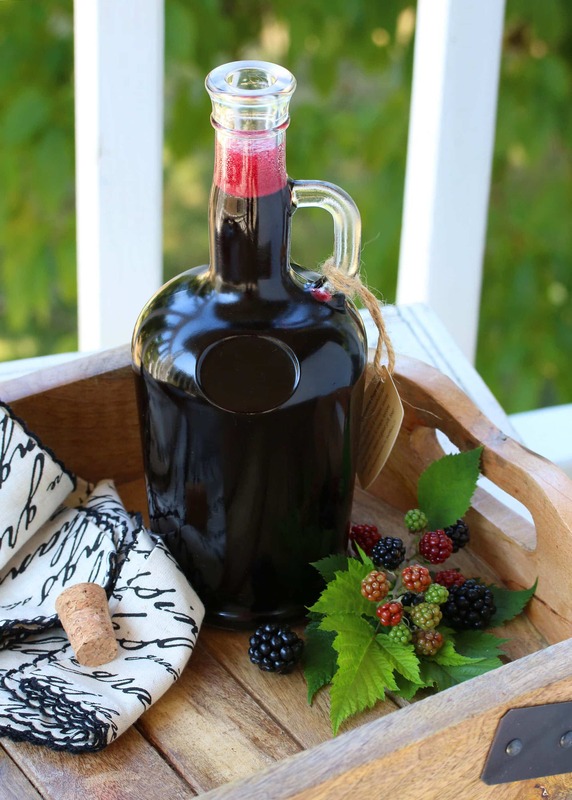 Making your own blackberry syrup is easy and the end result is incredibly delicious! This recipe includes instructions for canning the syrup for long-term storage so you can enjoy your blackberry syrup all year round! Place the blackberries in a medium-sized pot and bring them to a boil over medium-high heat. Once boiling, reduce the heat and simmer for 15-20 minutes until very soft and mushy. Remove from heat and mash with a potato masher to further break up the berries. Place the cooked blackberries in a fine-meshed sieve or colander or in a cheesecloth to strain the juice. 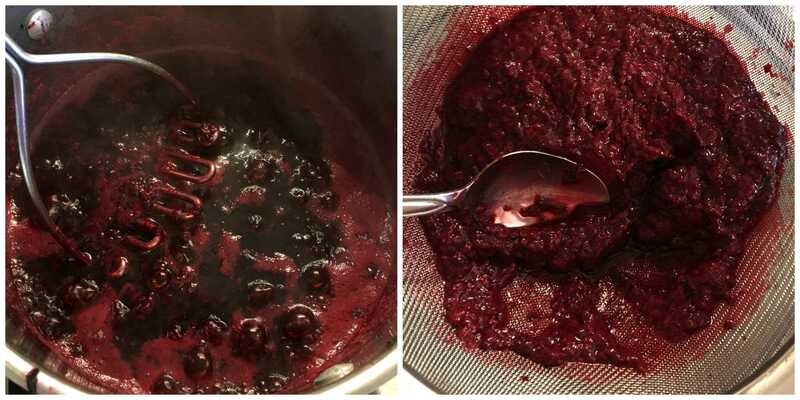 After the juice is done draining, use a spoon to scrape the puree around in the strainer to remove as much juice as possible, or squeeze the cheesecloth. You should have about 3 cups of juice. Rinse out the pot and pour the blackberry juice in it along with the sugar and lemon juice. Bring it to a boil and boil for 3 minutes. Stir in the pectin and boil for another minute. Serve immediately or store in fridge for up to 2 weeks. 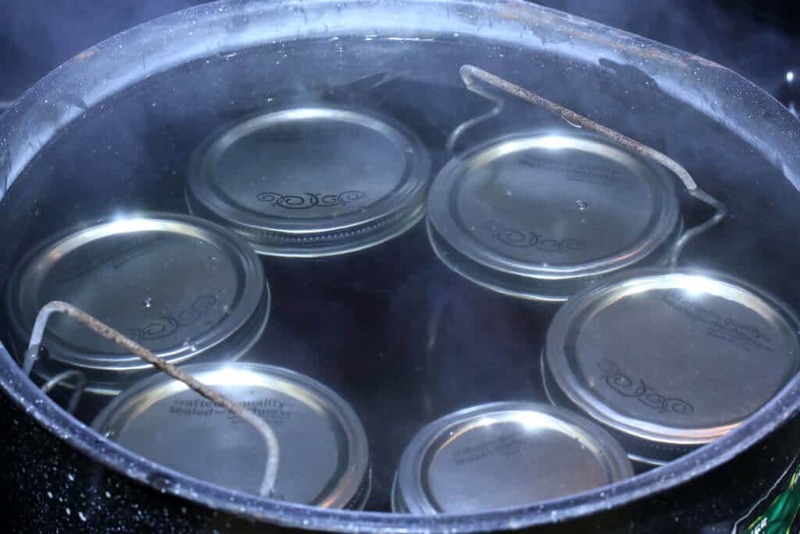 IF CANNING: Pour the hot syrup into sterilized jars leaving 1/4 inch headspace, wipe the rims with a damp cloth and screw on the lids. Process in a water bath, 10 minutes for pints and 15 minutes for quarts. Carefully remove the cans and let the rest undisturbed for 24 hours. Will keep in a cool, dark place for at least a year. Note: You can stretch this syrup further without diluting the flavor too much by adding 3/4 cup water with the blackberries (then add a little extra sugar/honey/sweetener when you add the strained juice back to the pot). At the end add an extra teaspoon of pectin at the end (or more if you prefer it thicker). I can’t even tell you how much I have been loving fresh blackberries! This looks amazing! I adore the flavor of blackberries but the seeds are always such a nuisance. 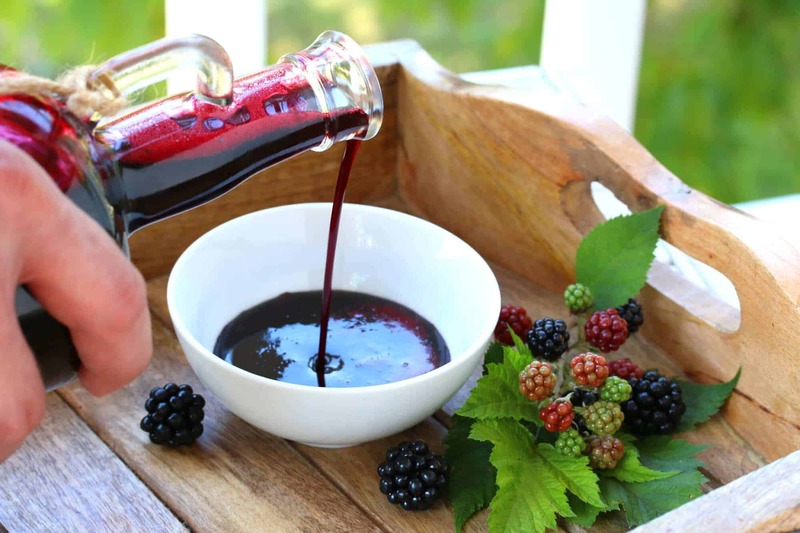 Your blackberry syrup is just the right thing for me! I love fresh blackberries and so wish I lived somewhere I could grow them! This looks so amazing!! I wish blackberries grew around here. This would be perfect for our weekend pancakes! I can’t wait to try this! I am so jealous of these fresh berries! Those are fine looking blackberries! Lucky you, we used to have some around our house then they were less and then no more. But never as big as yours. I used to make ice cream with them. Syrup looks quite delicious. I am drooling looking at this! Sounds perfect! This syrup looks so good! I feel like my pancakes will be a bit happier knowing this is going to be drizzled all over them. I am a blackberry lover and this is calling my name! Blackberries are one of my favorite things about summer. I can’t wait to make this syrup so I can enjoy it all year! Wow, I must make something like this. It looks terrific. I don’t think this would last much in my household. This is a perfect recipe to use uptake rest of my blackberries! Oh, how great to be able to pick so many blackberries, we have some but really just to enjoy a handful fresh from the bush from time to time. We were in France in summer though and I have never seen so many blackberry bushes growing everywhere in my whole life. Unfortunately in July they were all still green… I would love to make this syrup if I manage to find so many blackberries somewhere. This looks delicious! 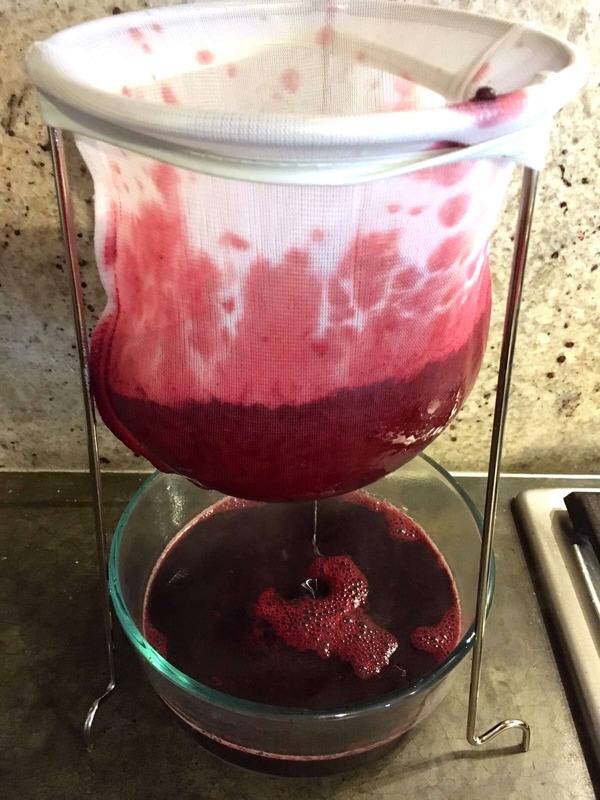 Would it be possible to send the berries through a food mill and keep the juice instead of cooking and straining? I use a juicer, I just keep running the pulp three, until I don’t get any more juice. Love this recipe! Where can I find the cool syrup jug? And can’t you can in it? Thanks, Starla! The jug was a fun find at a store called Home Goods. You need proper canning lids that seal for canning, but wouldn’t that be cool to be able to can it in bottles like this?? Love your container you have it in, where did you get that glass jug? a nice way to use the blackberry juice before adding pectin is making a wonderful jelly. 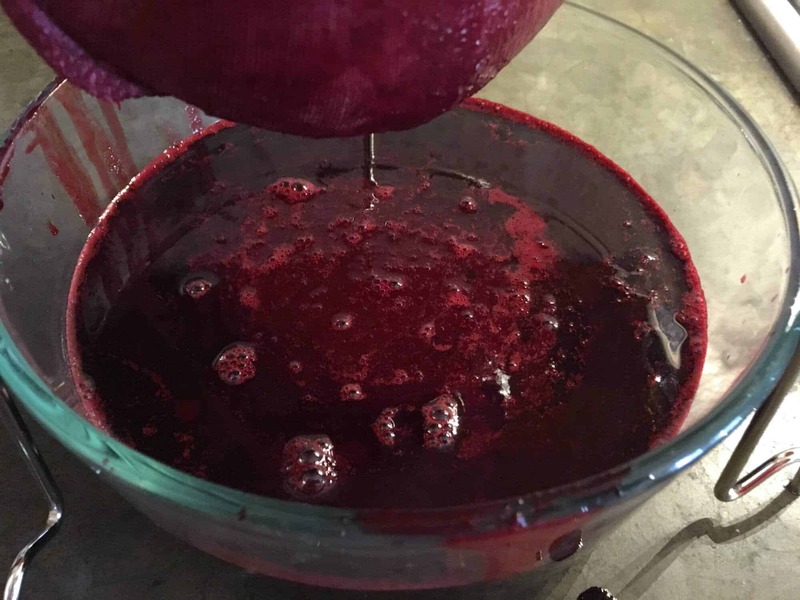 1-liter juice and 1 package ( 500 g ) jelling sugar(Gelierzucker 1:2 ), blend together in a large pot and bring to a rolling boil and let cook for 3 – 4 Minutes. Fill the hot jelly into clean glasses and put the lids on immediately. A sweet treat for many occasions. That sounds terrific, Editha, thanks for sharing! People liked the mix of pink and purple. That sounds fascinating, Cindy, thanks for sharing! Can I run my fresh BlackBerries through my juicer and then make the syrup from that? Hi Loree, if you have a masticating juicer (e.g. Omega), yes you can. A centrifugal juicer (e.g. Breville) will not properly juice the berries. Made this syrup. It is so delicious. I canned several jars and used the left over bit on vanilla ice cream. Thought I’d died and gone to heaven. It’s a keeper. Already added to my recipe book. Thanks. Fantastic, Jodi, I’m so happy to hear that, thanks for the feedback! Being a Washington State native, I make blackberry syrup and put it in small freezer jars or can it. My adult kids who live out of state each get jars over the winter, and they will call and giggle over how much it cured their homesickness! Try this on ham as a glaze, over chicken or turkey, and even salmon. Add it to a little apple cider vinegar and it makes a great salad dressing. Excellent tips, Debra, thanks for sharing!